Most good television shows are lucky to make it through five decent seasons. It's hard for the writers to keep coming up with new stuff after a certain period of time. Subplots are hinted at, then dropped. Characters are introduced, then forgotten. Things that made sense in season one just don't play anymore in season four. But over the last seven years, the writers for Stanford and USC football games haven't run out of good stuff. Somehow, even after all the crazy twists they make up, they always stick the landing. Stanford and USC has become one of the most compelling rivalries in college football, and with the 2014 edition this Saturday, it's worth examining just how much drama has played out over the past seven falls. Rivalries have to begin when someone - another team, another person, another nation - takes what you want. And after winning five straight Pac-10 titles under Pete Carroll, USC wanted a thousand year reign. Really, you already know the rest. Stanford denied USC the chance at that. Even though the Trojans still lorded over the Pac-10, this single embarrassing loss besmirched USC enough to expose that their time at the helm might be shorter than anticipated. Stanford entered the game as 41-point underdogs - the largest spread in college football history - and starting Tavita Pritchard, a sophomore who had thrown three passes in his career. As far as anyone was concerned, the Cardinal was dead on arrival. No shame in that, though. Stanford was 1-11 in 2006, while USC was the Rose Bowl champions. "He has not checked in with me about any of my career moves. I expect a call late in the week." "There is no question in my mind that USC is the best team in the country and may be the best team in the history of college football," Harbaugh said this week. "As a sort of college football historian, there's no question that this SC team ranks right up there." The game was almost just an afterthought. The Trojans led 16-7 after three quarters - the odd margin due to the fact that Stanford had blocked an extra point in the second quarter. In the fourth quarter, the teams traded touchdowns, then the Cardinal added a field goal on the next drive. Trojan quarterback John David Booty threw his third pick of the night on USC's next drive, giving Stanford the ball on the 45 with 2:50 left. Five plays later, With his back against the wall, Pritchard found wide receiver Richard Sherman for a first down on 4th-and-20 to give the Cardinal new hope. Four plays after that, Pritchard found Mark Bradford in the corner of the end zone. 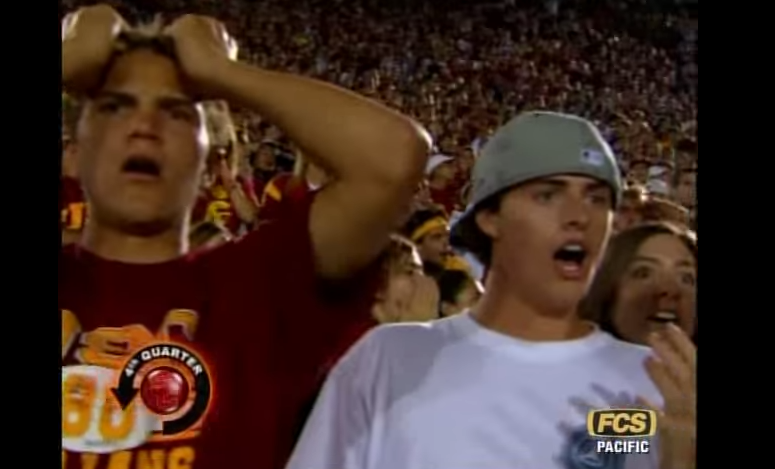 The broadcasters are so shocked that the play-by-play announcer screams out "Touchdown USC!" and the color announcer forgets basic addition. I'm sure a few beer bongs helped cure these guys of that shock and anguish. The 2008 season started with high expectations for USC, who turned the reigns to new starter Mark Sanchez. Led by Sanchez and a group of supremely talented running backs - Joe McKnight, Stafon Johnson, CJ Gable and Ronald Johnson - the Trojans had overcome an early stumble at Oregon State to take control of the conference. Even though USC wanted to inflict every ounce of pain possible on their now-hated opponent, the Trojans came out a bit flat against Stanford. The Cardinal battled to a 17-17 draw at halftime. During the break, the Stanford band concluded their show by forming a giant "23," then a "24." Their final notes were drowned out by the home cheers. In the second half, USC was dominant, scoring 28 unanswered points to take a 45-17 lead. USC had exacted their revenge, and on top of that, they had covered the 24-point spread. But in the waning moments, Anthony Kimble returned the Trojans' kickoff 70 yards. The Cardinal offense covered an additional 26 yards in the last 1:20 of the game, then set up for a field goal with three seconds left. USC called timeout to ice Aaron Zagory's meaningless kick. Back on the sideline, Harbaugh decided to run another play instead of the field goal, and sent the offense back onto the field. As time expired, Alex Loukas found Austin Gunder for an 18-yard touchdown pass to cut the final score to 45-23. Or, for those counting in Vegas, a 22 point win. I distinctly remember the Stanford fans still left in the stadium laughing. Jim Harbaugh had once again delivered an outright middle finger, if not a direct flick to the nose of Pete Carroll. "He can do whatever he wants," Carroll said. "I don't care." Somehow I get the feeling that wasn't and still isn't true. On a bright November day, 90,071 USC fans packed the stadium for homecoming. It's not often you get to see a top-25 opponent for homecoming, but Stanford, behind running back/Canyonero Toby Gerhart, had a surprising 6-3 season going after defeating #7 Oregon at home the week before. A week after eviscerating the Ducks for 228 yards and three touchdowns, Gerhart poured more coal into his Heiman campaign by rushing for 178 yards and three touchdowns against USC, while new quarterback Andrew Luck threw for two scores and ran for another. The tipping point was early in the 3rd quarter when freshman quarterback Matt Barkley looked right, locked on to his receiver, and threw the ball right into the hands of Cardinal defensive back Richard Sherman. Sherman's pick-six sent the fans flooding for the exits. As per usual, Sherman celebrated responsibly. The drama of the game was long over by the 4th quarter - and then the the theatrics began. With a little over six minutes left, Gerhart converted from six yards for his third score of the day. Up 48-21, the Cardinal went for two. After Gerhart punched it in for a touchdown on his 29th carry of the afternoon, he jogged calmly back to the sideline as usual. The next thing he knew, Stepfan Taylor was running onto the field as Jim Harbaugh shouted for a two-point conversion. Confused and exhausted, Gerhart asked his coach what was going on. "I want to put 50 on these motherf***ers," Harbaugh replied. The Cardinal didn't convert the two, but added another touchdown four minutes let to set the 55-21 final score. After the season, Carroll left USC. New USC head coach Lane Kiffin brought the Trojans to the Farm ready to exact a little revenge - and he would almost get it in his first try. Tied at 14 late in the second quarter, Stanford was trying to scratch out one final scoring drive before the half. Stepfan Taylor, who would later be known for his proclivity at hanging on to the ball, had the ball ripped from his grasp. USC would wind up with the football, but not before Andrew Luck stepped in. It's almost fitting that the best defensive play of the game came from a quarterback - the second half of the game was bereft of defense. USC freshman wideout Robert Woods piled up an insane 224 yards and four touchdowns, while Luck was a precise 20-of-24 for 285 yards and three touchdowns. In the final moment's Trojan running back Allen Bradford plowed into the end zone with 1:11 left, leaving Luck just enough time to pilot a 62-yard drive, setting up Nate Whitaker for the winning field goal. Even after missing the extra point that had left the Cardinal down by one with four seconds left, Whitaker's strike was true. After having to celebrate the last two victories over USC from afar, Stanford fans rushed the field. 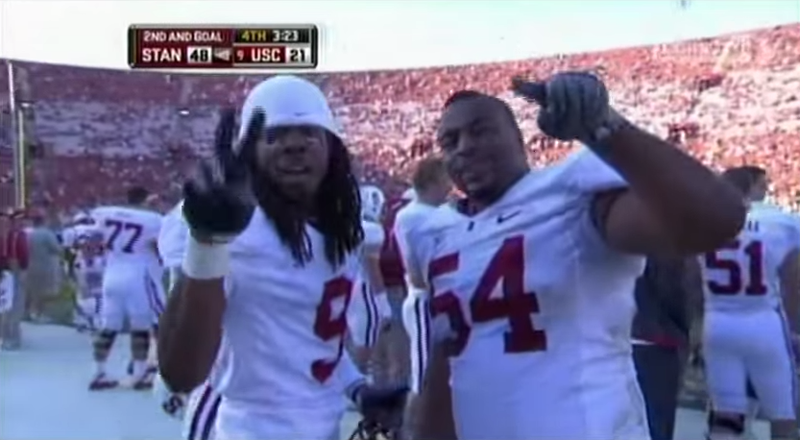 The 2011 iteration of Stanford-USC seemed preordained for something memorable. Matt Barkley and Andrew Luck squaring off again. College Gameday at the Coliseum. The biggest crowd at the gate since USC received devastating sanctions from the NCAA. The first half was dull, but the sun setting over the Hollywood hills felt like the lights dimming after intermission. It was one of those games that classics are made of - expert offensive football combined with just enough defense to make each possession compelling. USC struck first in the second half, opening up a 20-10 lead. The Cardinal found its footing again to retake a 24-20 lead, then the teams traded barbs to leave it tied at 27 with three minutes left. That left Andrew Luck and the Cardinal with three minutes to finish off USC on a final drive for the second year in a row. But after a wayward throw and a six yard run, the Cardinal were left with an all-or-nothing 3rd and 4. On the now-famous Spider 2 Y Banana, Luck dropped back and made the worst decision of his Stanford career - and triggered the second loudest moment I've ever experienced in a football stadium. However, the pick-six left Luck with another final chance - this time to tie the game - and he did. On to overtime. Stanford started with a touchdown and USC matched it. USC began the 2nd overtime with a touchdown, and then Luck found Levine Toilolo to tie it again. In the third overtime, Stepfan Taylor found pay dirt, then Luck feinted right before spinning a dime to Coby Fleener for the extra two points. USC needed eight to match, and as the Trojans once again threatened the end zone, Terrence Stephens' powerful right hand thumped the ball out. The ball squirted into the end zone - triggering a gasp from the still-packed Coliseum - and AJ Tarpley pounced on the football to extend the Cardinal's 16-game win streak. Brent Musberger's final call? "Cardinals win it!" These broadcasters, man. In January of 2012, Matt Barkley stood in front of a Christmas tree in USC's Heritage Hall and threw up two fingers on his right hand. He'd be back for one final season - the Trojans had unfinished business. This inspired Shayne Skov to tweet out his thoughts regarding Barkley. USC opened the season at number two in the polls, and the cover of Sports Illustrated's college football preview noted that "Matt Barkley is back - and he didn't stay to play in the Holiday Bowl." Stanford wasn't the same team that had beaten the Trojans the last three years. Most importantly, there was no Andrew Luck to bail out the Cardinal. Perhaps the Trojans' tormenter had finally left this plane. But it wasn't the Stanford offense that was USC's problem now. The Stanford defense - led by Skov - battered Barkley from the opening whistle. USC center Khaled Holmes couldn't play, leaving a gap in the middle that the Cardinal stormed over, around and through. In total, the Cardinal sacked Barkley five times, and Josh Nunes' 37-yard touchdown pass to Zach Ertz in the 4th quarter was good enough to set the 21-14 final. The ignominy for USC ended after Barkley's last pass - on 4th down and 40 after two Stanford sacks - fell astray. One young girl in a red Stanford sweatshirt -- she couldn't have been more than 18 -- rushed up to Lane Kiffin and just started screaming, "[Bleep] you, Lane Kiffin! [Bleep] you, you [bleepin'] loser!" The real question, though: how many USC fans wish they could have had done the same thing? In his postgame press conference, Barkley was borderline catatonic. This was not what he had come back for. USC ended their season by losing in the Sun Bowl, with Barkley on the sideline, his arm in a sling. Kiffin's fall hit a flat spin in mid-2013, and he was axed on the tarmac after a weak performance against Arizona State. 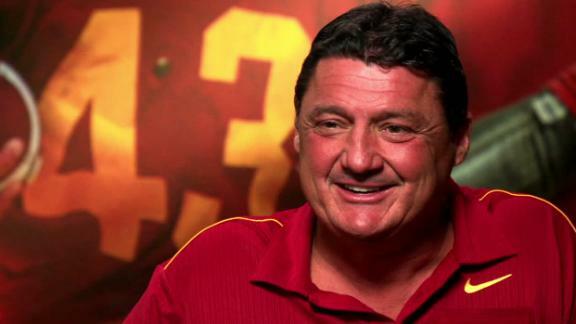 In his place, former Ole Miss head coach Ed Orgeron stepped up to lead the Trojans. Orgeron, who compiled a disastrous 10-25 record in Oxford, had always been painted as a Cajun cartoon character for his thick Louisiana accent, macaque-red face and vein-bursting screams. But in the wake of Kiffin's firing, the Trojans embraced Orgeron. They played inspired football, turning the game into an ugly trench war. USC rushed out to a 17-7 lead. 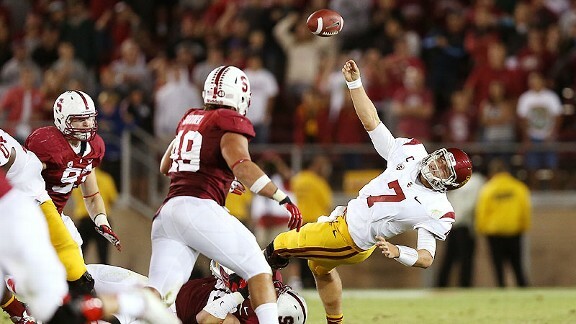 In the second half, the Trojans blocked a kick and intercepted Kevin Hogan on the six-yard line. Once again, it came down to the final moments. With three minutes left in the game, Hogan, draped by two defenders, flung the ball skyward, where Su'a Cravens hauled it in. With 19 seconds left, Andre Heidari nailed a 47-yard field goal into the open end of the Coliseum. The USC fans rushed the Coliseum field. Trojans players grabbed a grinning Coach O around the neck. And they did all this after beating Stanford. 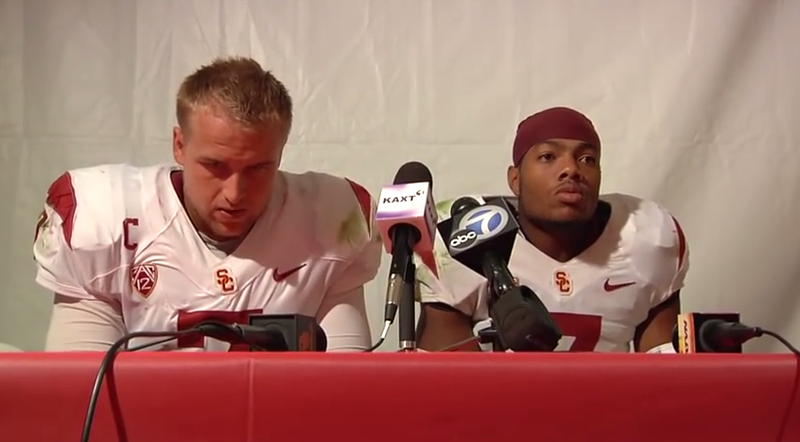 After all, an entire class of USC students had never beaten the Cardinal. That was now over. Up was now down. After seven years, the stories just keep piling up. Each episode is more dramatic than the last. And the subplots are everywhere you look. Tavita Pritchard is now the quarterbacks coach at Stanford. Jim Harbaugh and Richard Sherman and Pete Carroll all continue to torment one another in the NFL. Khaled Holmes now snaps the ball to Andrew Luck. Orgeron doesn't even have a job at the moment. So don't let us down, 2014. You're up.